Learn Android Studio covers Android Studio and its rich tools ecosystem, including Git and Gradle: this book covers how Android Studio works seamlessly with Git, for source control, and Gradle, a build and test tool. In addition, this book demonstrates how to develop/collaborate with remote Git web-hosting services such as GitHub and Bitbucket. Four complete Android projects accompany this volume and are available for download from a public Git repository. With this book, you learn the latest and most productive tools in the Android tools ecosystem, and the best practices for Android app development. You will be able to take away the labs' code as templates or frameworks to re-use and customize for your own similar apps. Android Studio is an intuitive, feature-rich, and extremely forgiving Integrated Development Environment (IDE). This IDE is more productive and easier to use for your Android app creations than Eclipse. 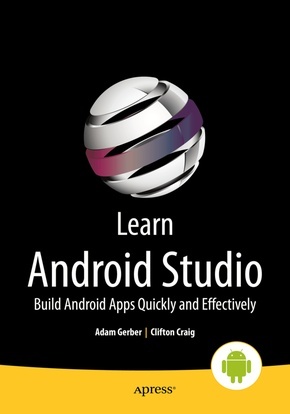 With this book you will quickly master Android Studio and maximize your Android development time. Source code on the remote web-hosting service is targeted to the latest Android Studio release, version 1.2.